If anybody in the field of education can own to 15 minutes of fame it’s Sir Ken Robinson. His 2006 TED talk on how modern schooling kills creativity has become the most popular TED ever, with 30 million viewings reaching an estimated 300 million people. It has made him chief flag bearer for the side of reason in the great battle for public education. 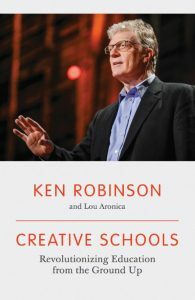 Creative Schools is Robinson’s latest grenade lobbed into battle, his response to requests for more detail on how to resist the ever-rising tide of standardisation, and how to enact his ideas that harness the opportunities of the 21st century and allow every child to flourish. So Creative Schools should be a landmark text for all New Zealand teachers, school leaders and trustees struggling to drive a modern learning environment, or figure out a modern learning pedagogy, or just fashioning a coherent response to the charge that schools fail too many students. Robinson’s latest grenade lobbed into battle – how to resist the ever-rising tide of standardisation and allow every child to flourish. But as a handbook for reform Creative Schools falls short. Yes, it is peppered with case studies of teachers and principals doing great things against the odds; it sparkles with wit and wisdom. But the book is like an extended TED talk, maddeningly invitational, but without the real substance that could inform our next steps. Yet the focus on USA and UK education systems does offer one striking message for New Zealanders – that we’ve done better than most to resist the GERM (Global Education Reform Movement) – so far. Robinson is at his best lambasting the New Right (his exposé of Pearson International is brilliant) and to this end Creative Schools is a worthy addition to the bookshelf of cautionary tales.